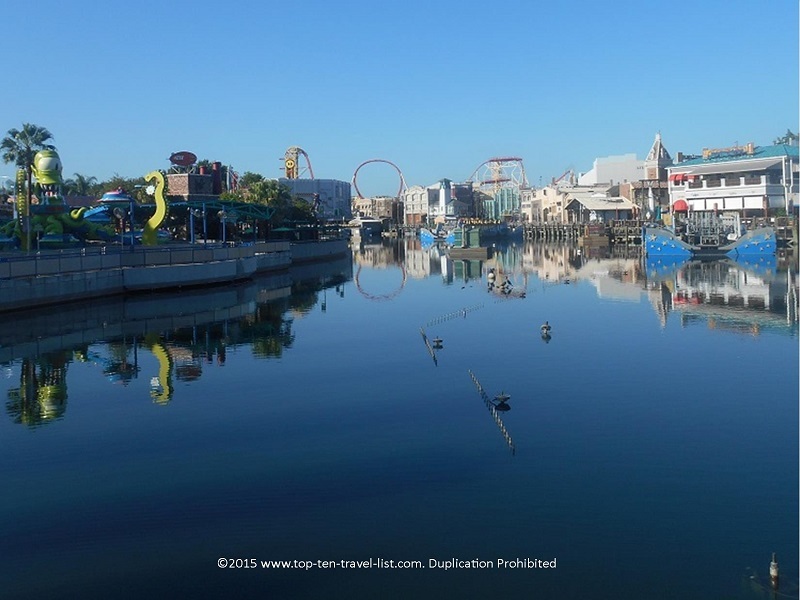 13 Can't Miss Rides & Attractions at Universal Studios Orlando - Top Ten Travel Blog | Our experiences traveling throughout the US. 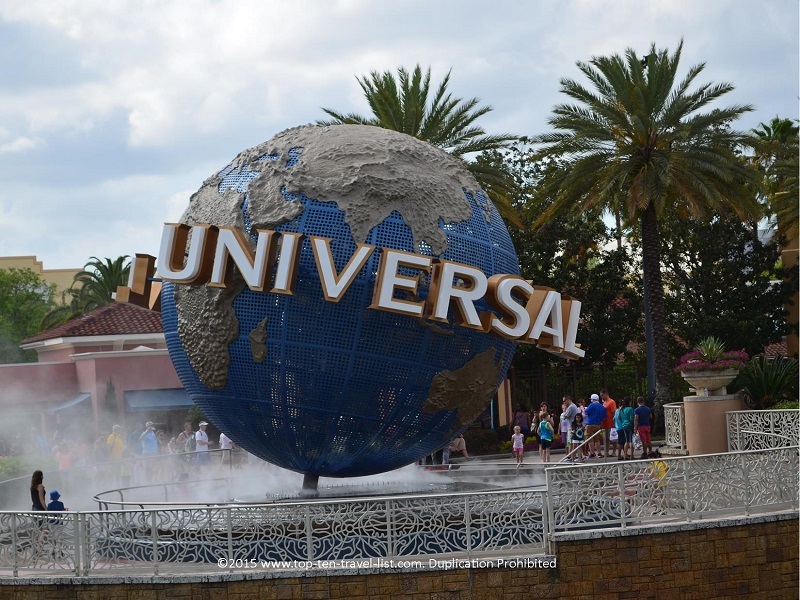 A trip to Orlando’s Universal Studios typically goes hand in hand with a Walt Disney World vacation. 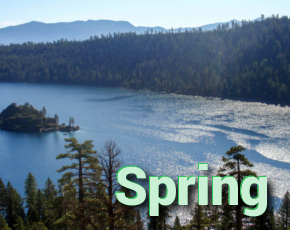 While both parks are completely different, they are alike in that they both offer world class themed rides, entertaining shows, and top notch attractions. Both parks are completely worthy of a separate vacation. However, if do plan on squeezing both theme parks into a single vacation, be sure to purchase a multi day pass to Universal, which is home to 2 fantastic parks of its’ own. You will not be able to get on all the rides and see all the shows on a one day visit (especially if you visit during the busy summer season). However, if budget or time limits you to 1 day, be sure to check out the attractions and rides listed below and purchase a fast pass which jumps you to the front of the line! 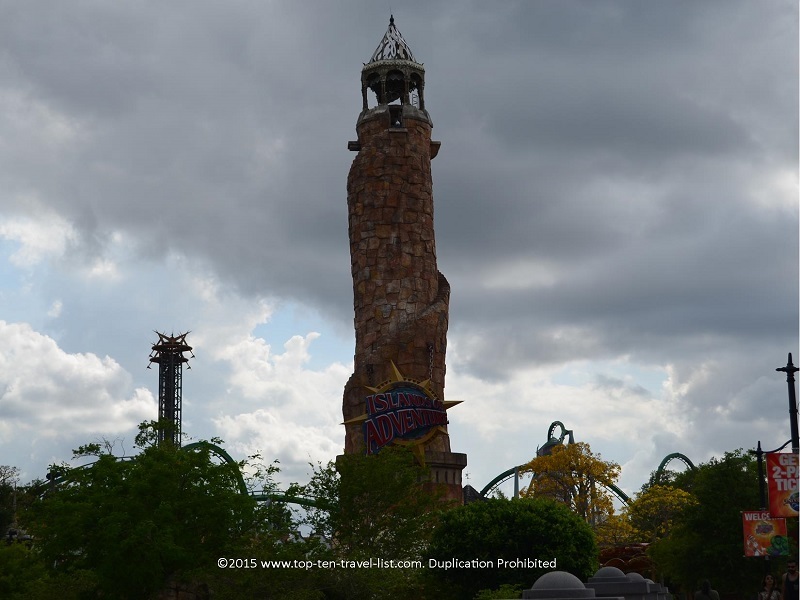 Islands of Adventure and Universal Studios are both well-maintained, staffed by friendly smiling faces, and feature a beautiful design and layout. Both Universal Studios and Islands of Adventure offer one of a kind movie themed rides that cannot be found anywhere else. Park to park tickets are needed to access both parks on the same day. Luckily, the new Harry Potter inspired Hogwarts Express provides an easy, enjoyable ride to and from each park. Below are 13 of the best rides and attractions found within Orlando’s Universal theme parks. 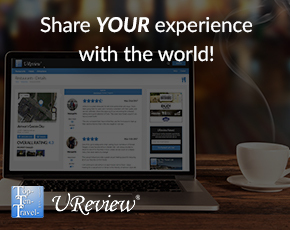 Take a look at the winners and be sure to share some of your favorites in the comments below. 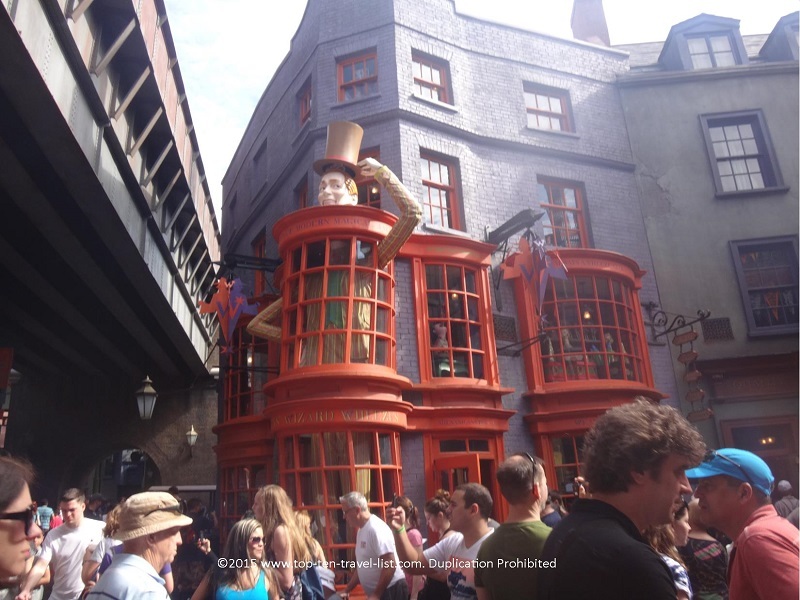 Universal’s newest addition to The Wizarding World of Harry Potter, Diagon Alley, is a must-see for Harry Potter fans: the only place in the world where you will feel as if you are in the Harry Potter films. The films are brought to life in a magical way with all your favorite shops, treats, and characters from the franchise making appearances. 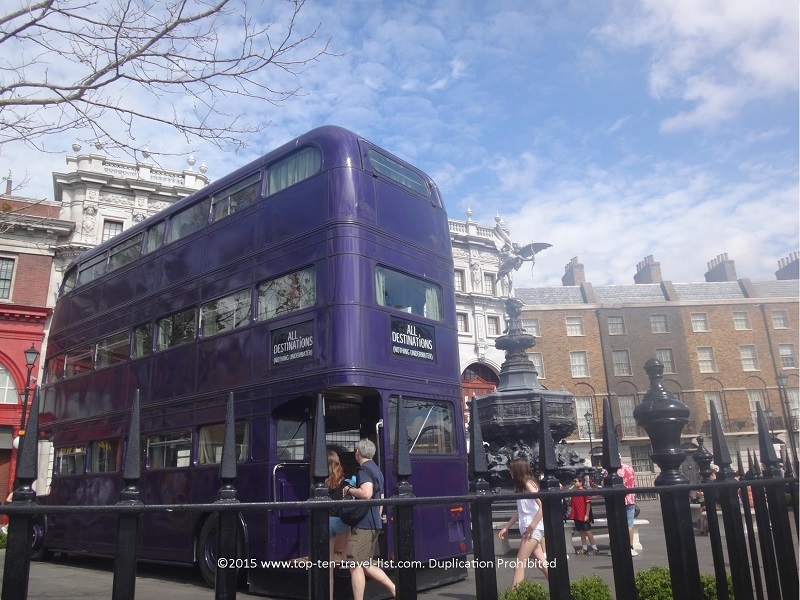 The Knight Bus is a perfect photo opportunity! The highlight here is the “invisible to muggles” London shopping district, featuring a handful of shops recognizable from the movies. 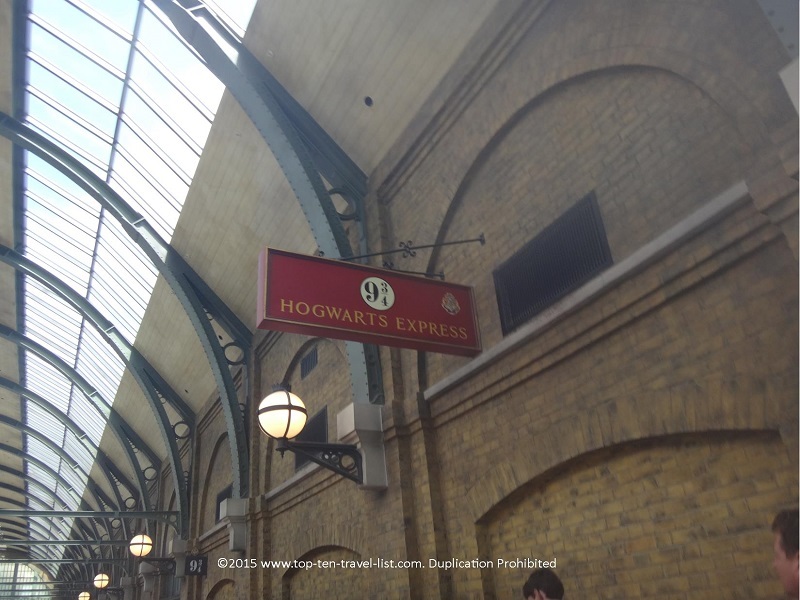 Other attractions at Diagon Alley include: the Hogwarts Express (transportation between parks) and Universal’s newest attraction, Harry Potter and the Escape from Gringotts (a 3D/roller coaster ride). The Platform 9 and 3 quarters sign at King’s Cross Station. 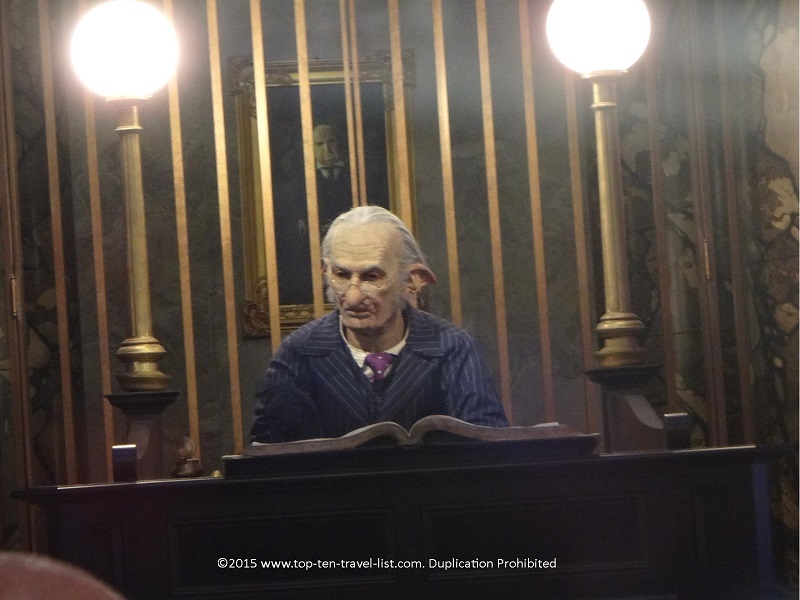 Escape from Gringotts is one of the best rides at the park; an entertaining 3D roller coaster experience. As you walk around the Diagon Alley shops, you will be transformed into the world of Harry Potter. You will forget you are at Universal as you pick out your own wand at Ollivander’s, sip Butterbeer, and purchase a Chocolate Frog for your ride on the Hogwarts Express. 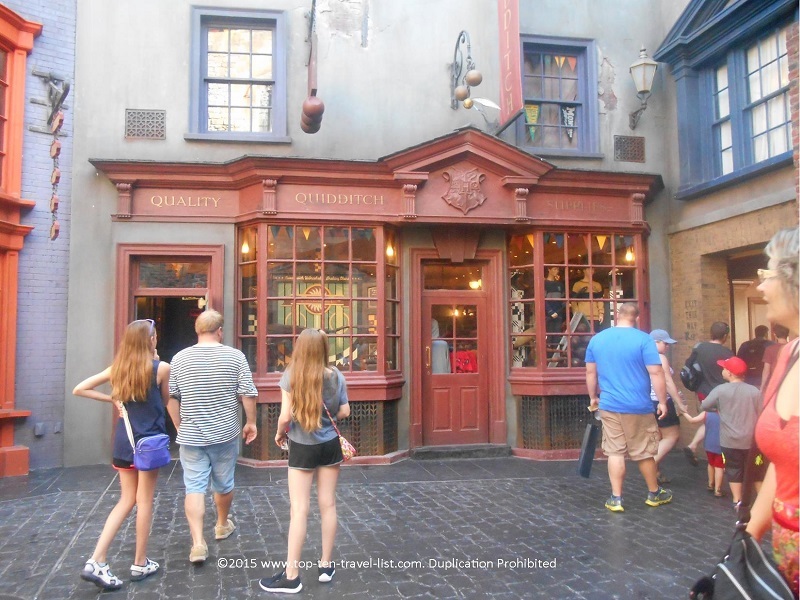 Ollivander’s Wand Shop – Pick out your own wand! A must for any true Harry Potter fan! Weasley’s Wizard Wheezes – Here you will find a selection of great joke gifts including Sneakoscopes and Extendable Ears. Weasley’s Wizard Wheezes carries a wide assortment of gag gifts. Magical Menagerie – All your favorite animals featured in the films, from owls to hippogriffs, can be found here. Madam Malik’s Robes for All Occasions – Here’s your chance to get your own wizard robe. Also available: Mrs. Weasely’s adorable Christmas sweaters. Wiseacre’s Wizarding Equipment – Here you can find all different sorts of magical wizard products such as crystal balls and hourglasses. Quality Quidditch Supplies – Pick up all your Quidditch supplies and stock up on apparel from your favorite team. Borgin and Burkes – Head down dark, creepy Knockturn Alley to stock up on your Death Eaters novelty items like skulls and other dark gifts. This creepy alley appears just as it does in the movie with an overall sinister feel and cool special effects including a dark, stormy sky. 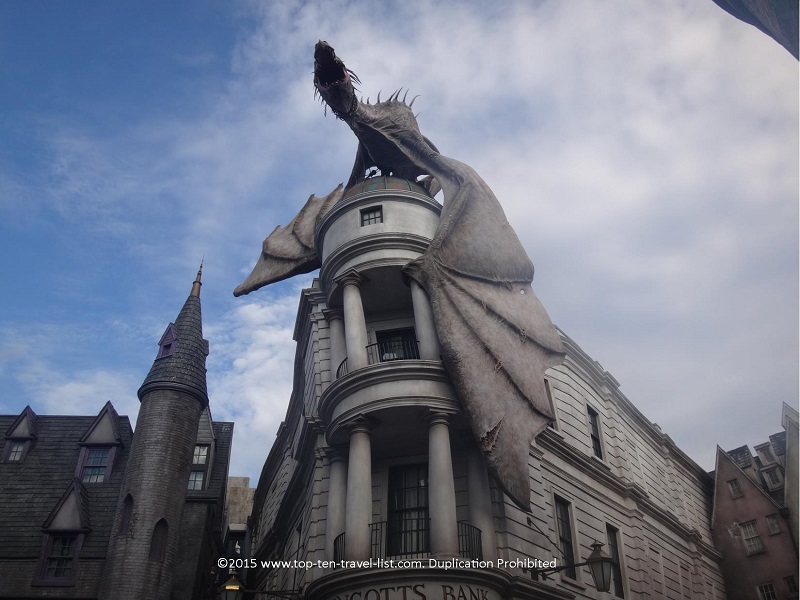 Another cool Diagon Alley feature: watch out for the dragon on top of Gringotts which blows hot air on you as you pass by. The Gringotts bank dragon blows real fire several times each hour. In addition, be sure to stop for a Butterbeer and traditional British meal at the Leaky Cauldron. At Diagon Alley, you are able to board the Hogwarts Express to Hogsmeade at Islands of Adventure. This is a great festive way to travel between parks while keeping the Harry Potter atmosphere going. 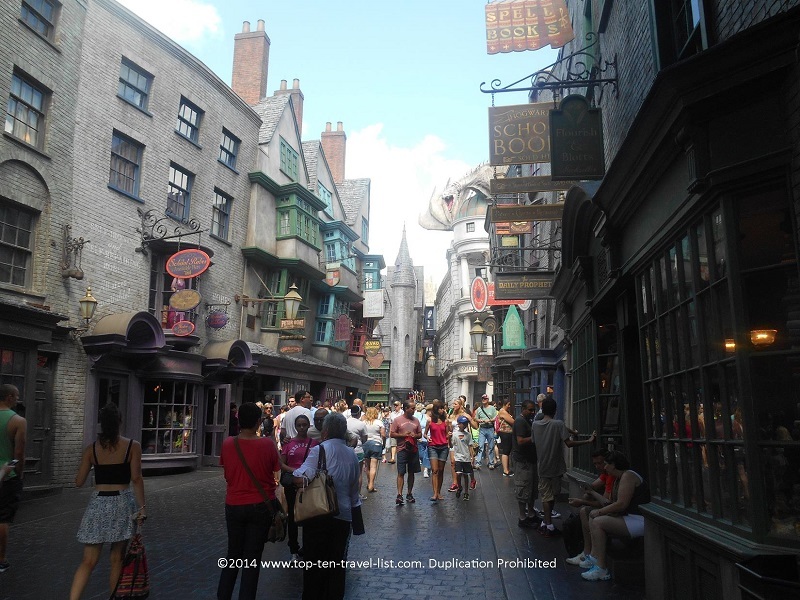 The cobblestone streets, friendly Harry Potter dressed staff, and general enthusiasm of the crowds adds to the excitement! The combination of great movie themed rides, gifts, special effects, and treats makes Diagon Alley the number one stop for any Harry Potter fans out there!